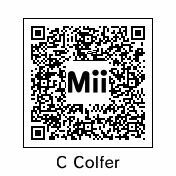 Gleeks unite, as Nintendo have provided the opportunity to download a Mii character created by Chris Colfer, who plays Kurt Hummel in popular television series Glee. Sadly, it’s only available to those in North America. Nintendo 3DS owners will be able to scan the QR code below, after which his Mii will strut its stuff on your handheld. To download, open the ‘Mii Maker’, choose ‘QR Code/Image Options,’ and then ‘Scan QR Code.’ Enjoy! Another Region locked QR code? Come on.. I’m sure they are trolling me..